When it comes to better understanding a medical condition like congenital heart disease, often the basic fast facts are enough to give you the information you’re looking for. Here are the basic fast facts of congenital heart disease. Congenital heart disease is also referred to as congenital heart defects. About 8 in 1,000 infants are born with one or more congenital heart defects. About 35,000 infants are born in the US every year with congenital heart disease. The condition affects blood flow or other issues. Congenital heart defects range from mild to extremely severe. Common symptoms are shortness of breath, blue tint to skin and reduced circulation. Symptoms of congenital heart disease are not the same as symptoms of a heart attack. Diagnosis can sometimes be made through prenatal ultrasound. 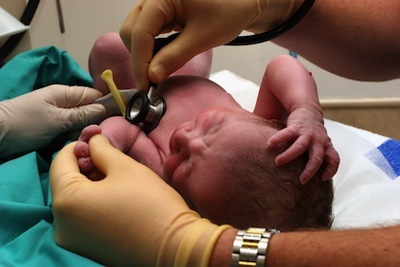 Many cases are not diagnosed until after birth, during childhood or early teens. Mild forms require no immediate treatment. Severe forms may require medical intervention during infancy. Medical intervention may include catheterization or surgery. Extremely severe cases of congenital heart disease require a heart transplant. The condition can grow worse with age. Regular check-ups are the standard of care for mild cases. Medical care will be required for life. Treatments are based on severity and type of condition. Infant growth is monitored closely due to slower growth rates. Development in infancy may be slower than peers. Feeding schedules may be required to improve caloric intake. Exercise limitations must be discussed with the heart specialist. The school must be advised of exercise limitations. Emotional issues may arise in late childhood and early teen years. Learn everything you can about your child’s condition. Find a support group online or offline to help ease the struggle. There is no known definitive cause of the condition – don’t blame yourself. Mild forms of the disease will not affect lifespan. Severe forms of the disease may shorten lifespan if not medically treated. The diagnosis of Congenital Heart Disease often requires an extensive education and understanding of the condition. If you or someone you know has a child with a Congenital Heart Defect, learn the facts and seek a support group to help you deal with the everyday issues of raising a child with heart disease.